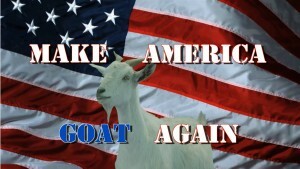 Goat Rodeo returns to the Philly Improv Theater (PHIT) this week to kick off a four-night engagement of their brand new sketch show, appropriately pun-titled, ‘Make America Goat Again’. In our opinion this is the perfect way to celebrate the beginning of the electoral primary season and learn about the issues that matter to goats. Goat Rodeo is Christian Alsis, Dan Boldin, Daniel Corkery (House of Solitude), Bill Flynn, Kristy Goldy (Youth Large), Jimi Haak, Chris McGrail (Hey, We’re Cool), Justin Miller, Kevin Pettit, Samantha Russell (Secret Pants/Youth Large), Sue Taney (ComedySportz Philly), Zachary Uzupis, and Aubrie Williams (ManiPedi). Goat Rodeo is directed by Samantha Russell with Christian Alsis serving as head writer and Bill Flynn as production/tech coordinator. Opening for Goat Rodeo both nights this week, the newest sketch group in the Philly comedy scene, It’s The New! Featuring material written and performed by Jackie Benhayon, Erin Fleming, Dru Kramcsak (Monologues at PHIT), Jack O’Keeffe (Wretched Hive/Music Show), Andrew Nealis, Bill Reick, Gabby Thom (Wretched Hive) and Tnutt (Good Wheel Hunting). The Sideshow was created by Mike Marbach and is PHIT’s variety showcase for all types of comedy in one convenient slot. You want to see improv? We got it. Stand-up? Yup. Sketch? You betcha. And a ton of other funny things that don’t quite fit into any one category. From established acts to one night only groupings to experiments gone wrong… the Sideshow has it all! This month features performances from sketch groups, Wretched Hive, The Incredible Shrinking Matt & Jacquie, Until Pluto and Mean Wendy Band as well as an improvised horror movie from Stay Dead.